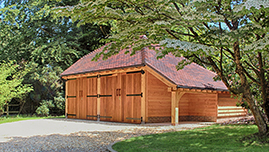 We are local specialists in crafting timber, oak framed barns and garages. Our work can be found across the counties of Herefordshire and Gloucestershire. 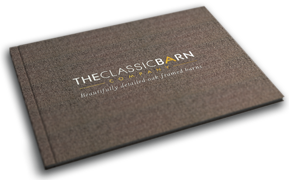 Created from high quality oak timbers, our classic barn buildings will stand for many years to come. We offer a large range of pre-designed barn style garages, which can easily evolve to suit your requirements. We pride ourselves on the quality of our workmanship and as such we don’t use quick-fit joints. Instead our timber framed barns will show an array of carefully crafted traditional mortice-and-tenon joints finished with oak dowelling. This is just one of the elements of detail you will find inside all of our classic timber barns. Combine this with our striking, hand crafted braces, generously cut beams and posts and you will have a building admired for its beauty and perfectly in keeping with rural areas. Working from our nearby office, our project manager will be with you every step of the way. From your first conversation with us, where we will steer you through the best timber framed design to meet your garaging requirements, right through to completion. If planning is required, we can even assist you with your planning application with the Herefordshire or Gloucestershire planning authorities or work with a local architect, depending on what suits your individual project needs. Accredited with awards, including the Guild of Master Craftsmen our oak barns have a reputation for being the most detailed frames available in the market place. With years of experience in building traditional timber framed barns and garages, our classic buildings offer a fantastic investment that will enhance your property. We would encourage you to visit one of our local projects or take a look at our gallery of work to truly appreciate the quality of the product that we offer. If you’d like to see more, please request a brochure or contact us for a no obligation consultation about your project. Commissioning projects in Hereford, Leominster, Ledbury, Ross on Wye, Kington, Bromyard, Hay on Wye, Eastnor, Goodrich, Walford, Hoarwithy, Much Marcle, Bishops Frome and Symmonds Yat.